Happy Halloween! In celebration of this candy laden holiday, I've ventured into the unknown and made something, for the first time ever, with pumpkin. Yes, I lived 10 years in the US but have never eaten, much less made, a pumpkin pie or anything like that. 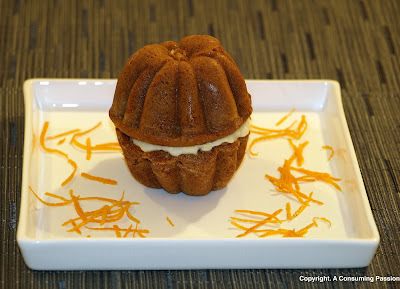 So, in the spirit of crossing yet another item off my culinary to-do list, I decided to bake little pumpkin patch cakes. Truth be told, the choice of what to make was made much much easier by the acquisition of a beautiful baking pan by Nordicware in the shape of little pumpkin halves. I bought this at Williams-Sonoma, a store which I absolutely adore. I lament everyday the fact that I did not take more advantage of it when I was living in the US but if I ever move back to America, it will be because of this store. No kidding. In fact, whenever I travel to the States now, I always return with a suitcase full of things that I have picked up from Wiliams-Sonoma. This pan was one of those things that I lugged back to London at the risk of overweight baggage and all. 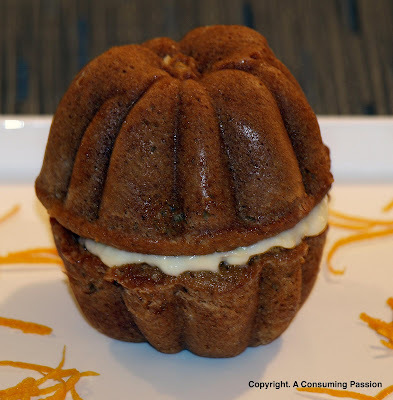 Since the pan bakes up the pumpkins in halves, one can choose to assemble the cakes into whole pumpkins with a layer of frosting in between (as shown above) or simply serve them as is as little tea cakes of sorts. As the assembled pumpkin turns out to be fairly large, I decided to assemble half of them and leave the rest as is. For those who don't have a special pumpkin shaped pan, don't let that deter you. I used some of the excess batter in a regular muffin pan and it turned out really well. The frosting can then be used to frost the muffin, like a cupcake. I was pressed for time while making these but I think the pumpkins would do well with some icing decorations such as little leaves or tendrils. Despite the plainer look though, the cake was absolutely delish. A little big to hand out to trick-or-treaters, perhaps, but they'd definitely work well at a Halloween or Thanksgiving party. Position a rack in the lower third of an oven and preheat to 350F. Generously grease and flour the wells of the pumpkin patch (or muffin) pan; tap out excess flour. To make the cakes, over a sheet of waxed paper, sift together the flour, baking powder, baking soda, salt, cinnamon, ginger, nutmeg, allspice and cloves; set aside. In the bowl of an electric mixer fitted with the flat beater, beat the butter on medium speed until creamy and smooth, 1 to 2 minutes. Add the brown and granulated sugars and beat until light and fluffy, about 5 minutes, stopping the mixer occasionally to scrape down the sides of the bowl. Add the eggs one at a time, beating well after each addition. Reduce the speed to low and add the flour mixture in three additions, alternating with the milk and beginning and ending with te flour. Beat each addition just until incorporated, stopping the mixer occasionally to scrape down the sides of the bowl. Add the pumpkin puree and beat until incorporated. Remove the bowl from the mixer. Divide half of the batter between the wells of the prepared pan and spread evenly. Bake until a toothpick inserted near the center of a cake half comes out clean, 18 to 22 minutes. Transfer the pan to a wire rack and let the cake halves cool upright in the pan for 15 minutes. Gently tap the pan on a work surface to loosen the cakes. Invert the pan onto the rack and lift off the pan. Let the cakes cool completely before decorating. Wash and thoroughly dry the pan, grease and flour the wells and repeat with the remaining batter. Meanwhile, make the frosting. In the bowl of an electric mixer fitted with the flat beater, beat the cream cheese on medium speed until smooth, 2 to 3 minutes. Add the butter and beat until combined, 1 to 2 minutes. Add the confectioners' sugar and vanilla and beat until fluffy, 2 to 3 minutes. Stir in food coloring as desired. To assemble the cakes, using a bread knife, cut off any portion of each cake that rose above the rim of the pan. Place a cake half, flat side up, on a cake stand or plate and spread the frosting on top. Place its matching cake half, flat side down, on top. Repeat with the remaining cakes. Refrigerate for 30 minutes, then decorate as desired. For unassembled cake halves, decorate the exterior of each half as desired. Welcome to the world of pumpkin!! I am a pumpkin addict and use it a lot in the fall. These are so adorable! I have been wanting to buy those...they look so cute.